4) must not be "piccolo marimbas". Image from here, and thanks to Scott at Olympic. But not every piano is a Steinway D, and the ones that aren't Steinway Ds are still pianos. Most xylophones are not like the Deagan De Luxe, but they are still xylophones. Consulting Deagan catalogues (as you can do at the Deagan Resource) you find that on most of their models bar width varied between 1 5/8" and 2" (41 to 51 mm) and bar thickness was usually 7/8" or 15/16" (22 or 24mm, give or take). Let's concede that going under about 22mm thick may start to compromise the longevity (and "repairability") of a xylophone bar. And the tone may become more PLINK than PING, which will be distressing to some players (and listeners). Other players (and listeners) may not notice, or care. 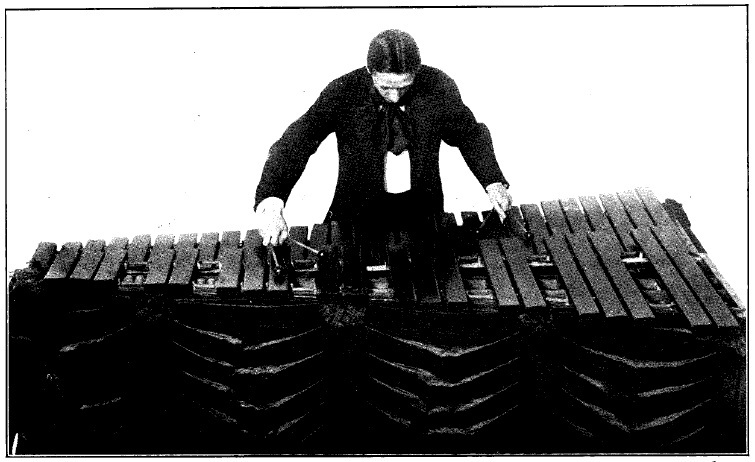 Quint tuning Nobody tuned any overtones on xylophone bars until about 1927, when the head tuner at Deagan, Henry Schluter, introduced quint-tuning (fixing the first audible overtone at a twelfth above the fundamental of the bar). It can't be said that this innovation immediately became the rule. All modern xylos have (some of) their overtones tuned, but they are by no means all quint-tuned. I've heard that the majority of European instruments are octave-tuned. On old(ish) instruments I've examined (Premier, Bergerault) the only intentional overtone tuning was octave tuning, and it really didn't extend very far. Paul says "octave tuning just sounds wrong – a xylophone has a jarring sound, that is what it is for musically" Hmmm. Schluter was trying to make the sound sweeter; if perceptible overtones are accurately tuned you minimise clashes between the fundamentals of high bars and the overtones of low bars. Suppose a bottom F has a prominent overtone that is 40 cents sharp to the C a twelfth above, this may make a triad on F rather more piquant than is desirable. But whether you align that overtone to a twelfth or to a double octave -- consonant intervals both -- doesn't seem to me to make a great deal of difference. There is certainly a difference in sound between quint-tuned and octave-tuned instruments, and I wouldn't disagree if you told me that octave tuning is blander. But either way you are no longer in the wildwood where the jarring cry of the xylophone rings out from its hidden nest in the undergrowth. If you want the true wild xylo untamed, leave its overtones untuned. NB I doubt Schluter chose quint tuning over octave tuning for aesthetic reasons. Given the basic design of the instruments he was working with it may have been the most obvious solution. I may discuss this in a future post. No padouk thank you Current practice is pretty uniform across the industry. Professional-level instruments have keyboards of honduras rosewood (Dalbergia stevensonii); the universal second choice, for entry-level and student instruments, is African padouk (Pterocarpus soyauxii). 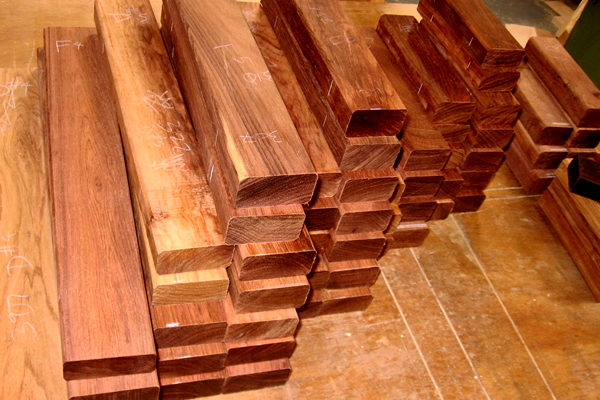 For the manufacturer padouk has various advantages; it is inexpensive (for a tropical timber), it is widespread and not endangered, and it comes from whopping great trees that provide great chunks of timber with straight grain and consistent density, easily machined into quarter-sawn bar stock. All of which would be beside the point if it sounded terrible, but actually it sounds pretty good. I don't know when padouk ascended to the number two slot. In my workshop I have a random selection of bars from trashed instruments that I've picked up here and there. I'd guess some of them date back to the 70s and 80s, but some could be considerably older. None of them are padouk. The ones which aren't rosewood tend to be made of woods I can't identify, but which look and feel more like african or far eastern "mahogany". Padouk is considerably less dense and less hard than rosewood. Density and hardness are not particularly correlated with musical virtues (many woods are close to rosewood in density but sound hilariously duff) so this is no great surprise, but as Paul Jefferies points out, padouk will not be as durable. However it is "good enough" for the job, unless you want to serve only the most demanding and discriminating customers, not necessarily the best way to succeed in the music biz. 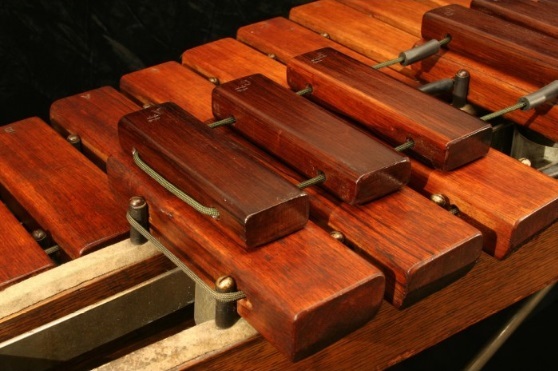 As for the situation in the early 20th century ... Deagan used honduras rosewood and cocobolo ("Nagaed" and "Klyposerus" in Deagan-speak) from ... well, I assume from their earliest models. But I wonder if rosewood was so promptly adopted in Europe, where after all xylophones had surely been constructed of local temperate timbers for centuries. -- were not made of well-seasoned top-grade rosewood (and weren't constructed in climate-controlled environments with computer assisted tuning). Oh, and they probably didn't have any resonators. Looking through the Deagan catalogues we find a wide array of models varying in range, pitch and designation. Xylophones, marimbas, marimba-xylophones ... 3 octave, 3.5 octave, 4 octave, even 5.5 and 6 octave instruments (though no images seem to exist of these, quite possibly they were never built) .... Competitors followed the same path, with Besson providing Teddy Brown with a 5 octave xylophone, Leedy producing a 5 octave "marimba xylophone", and Premier and Bergerault offering "xylorimbas". However although these fossil organisms crop up in the deposits with bewildering frequency, evolution seems to have left us with the two fittest species; the 4.3 or 5 octave marimba, highest note C7, and the 3.5 or 4 octave xylophone, highest note C8. Organologically identical (wooden, idiophonic, mallet-struck, with aerophone resonators, Sachs-Hornbostel class 111.212) the musical community has accepted the two instruments as distinct voices; one high, one low; one bright, one mellow; one is dancing skeletons, the other the voice of the forest. It is interesting (but not surprising) that such a simple thing as shifting the pitch centre by an octave should have such considerable effects. Perhaps it is slightly surprising that the development seems to have taken so long, as what now seem to be central characteristics of the marimba -- a graduated keyboard with wide bass bars, extension to low A, then C -- didn't become canonical until quite recently. And the more like a marimba the marimba becomes, the more the xylophone has to remain, defiantly, a xylophone. I'm not sure if I've answered the original question. What is a xylophone? Well, it's not a marimba. Any other answers? Previous article:What is a xylophone? My name is Paul Jefferies and I am furious! Not really, these are good articles, make a fascinating read and discussion is positive. After all I do make my views publicly, because I resist the natural inclimination towards having a protectionist attitude that stymies progress. However I will expand on some of the points and explain my point of view, but I will compress the first three into one and take the fourth first. Your conclusion hits the nail on the head. Marimbas are becoming more and more “tonal” with wider and wider note bars making instruments that are ridiculously big (more controversy for you to rip apart!) This is a trend of the moment (20 years or so) and it looks like it will stay. Marimbas are being heavily developed, and the market must be there. Marimbas are cool. In contrast xylophones are neglected and uncool. Indepedence for Xylophones! Fist in the air, we need revolution! Xylophones will become extinct. What is the point of owning one if as a player all you have to do is play your marimba with hard mallets? Why not just buy a xylorimba - Premier used to sell a lot of them. The problem with the Premier xylorimbas was they were too “xylo” not very “imbarry”. There needs to be a difference in the tonal and tinbral character between the instruments. I am not alone, this is what I hear all the time from my customers which goes a long way towards forming my views. 1-3) Thick bars and quint tuning to give a jarring staccato sound with note bars made from rosewood not cheaper alternatives like padouk. Padouk is my preferred choice for marimbas, I think it sounds better, but it just doesn’t last on xylophones which are being continuously struck with small, round, hard, rosewood mallets. Beech would be better than padouk, or if it is ok to have notes that fall apart after a couple of years, why not just use a softwood and save us all the hassle of tuning issues and save the planet to boot? Thicker bars give a brighter sound, mainly because of the hard beaters, but these beaters emphasize lateral and torsional overtones. Having thicker bars helps to push upwards and and out of the human range of hearing those inharmonic overtones, as well as pulling other overtones down and into tune. Surely becoming better must be the target? But let us get real, about note bar dimensions, the discovery of a better sound was most likely a happy accident - the size of the tube available to make the resonators probably dicatated the width of the bar, and the depth was the standard plank size,etc As opposed to finite element analysis and/or experimentation. Either way, marimbas are becoming wider and thinner because they work better acoustically to emphasise the desired overtones, moving away from the xylphone sound, ergo xylophones should go towards the opposite direction. Finally, what I see when I look at a lot of xylophones are picolo marimbas. Literally. I could take the bottom octaves off a xylo and put them onto a marimba and they would be identical. This is because making the notes the same dimensions and tuning saves money during the manufacturing process. I for one will resist money grabbing, work shy, big business dictating to me the timbre of the instruments I use to artistically express myself musically. However back in the real world, because they are readily available and comparitively cheap (and nasty (and don’t last)) they are popular. A lot of schools have them (and I mean a lot), so over time because kids are learning on these instruments, their sound will become the sound of a xylophone. If we get there the xylophone will become uneeded, unwanted, unloved will die and become extint. Hallo Paul, I hoped you'd drop by. It seems we don't disagree on much at all. Except -- I really wouldn't prefer padouk to rosewood for a marimba keyboard, and I haven't (yet?) met a professional player who would agree with you. But I see where you are coming from. I will happily join your xylophone independence movement, but like you I am not very hopeful. The marimba is doing well: -- composers want to write for it, musicians like playing it, audiences seem to enjoy hearing it. The xylophone -- not so much. Even if it regains its distinctive old-school character that you describe so well, will there be music for it that people want to hear? There is an existing orchestral repertoire that xylophonists will (presumably) still be wanted for, but as a solo instrument in its own right? I fear that it has shot its bolt. I can't see musical history returning to the world of Teddy Brown or Grant Hamilton Green. With any luck I am wrong. But the issues are quite complicated, perhaps I need to write another post to understand them a little better. Quint tuning should make a big difference to a Xylophone compared to a Marimba with its double-octave. The quint is also a resonant frequency of the resonator tube, so its radiation into the air is effectively amplified as well as the fundamental. The double-octave on the Marimba is not a resonant frequency of the resonator tube so it is not amplified. Less of a difference with the keys by themselves, but more of a difference when placed over the resonators. At least that is the theory. The actual effect might not be that strong as the first overtone vibration has a node in the centre of the bar over the resonator, so you'll have equal amounts of positive and negative vibration (either side) over the resonator. It would be interesting to try a slightly off-centre resonator position that would catch both the fundamental and the quint to hear what that does to the sound. Perhaps slighty towards the centre from halfway between the cord hole and the centre of the key. Striking the key in this location will also bring out more of that quint.